‘Tis is the season for sumptuous food and memorable meals, complemented by scintillating wine and sparkling champagne. In the past, we’ve explored exotic cocktails, but herewith we pay tribute to wine – the nectar of the gods. 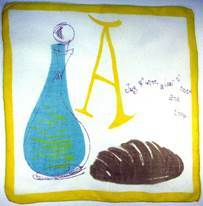 For millennia, man has labored to perfect and preserve the ambrosia of the glorious grape. 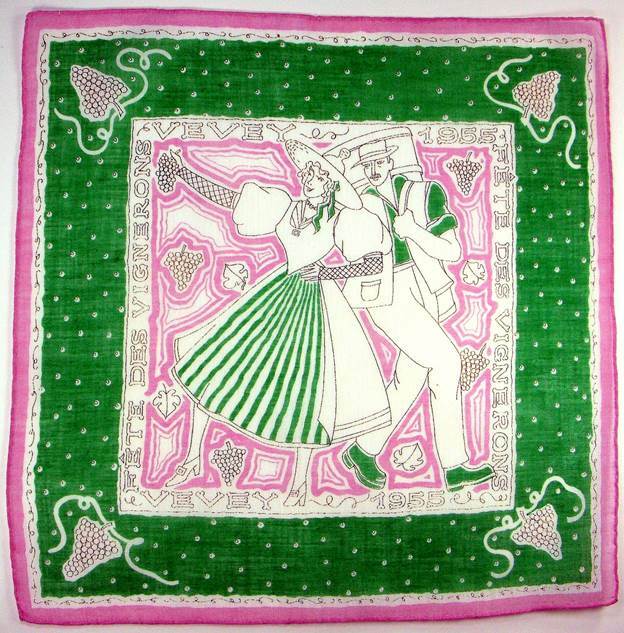 The love affair is unending, and the history of the handkerchief records this passion. A Merry Christmas/Happy New Year greeting features celebratory champagne. A nascent tower of champagne flutes commands center stage, but it’s the lush vine adorning the border that truly captures the eye. Who wants to take a guess at the storyline behind this terrific hankie? Be sure to read the descriptions of what bottle is needed when. Cute! 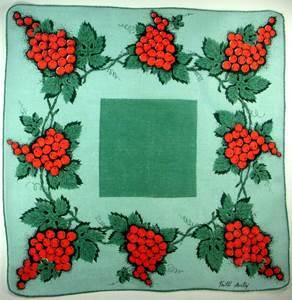 This image is captured from the center portion of a very large men’s hankie. 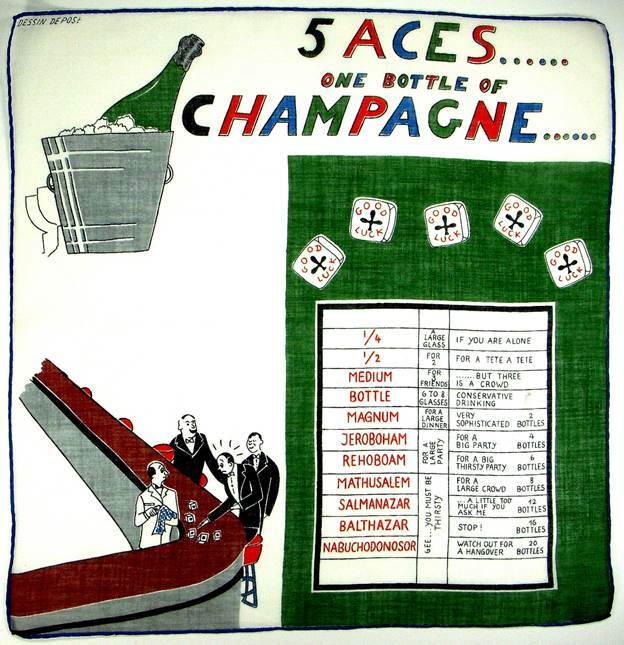 Today we can scroll through lists on our smart phones, but I’ll bet it was fun to pull this out at the club, aboard a yacht, or enjoying a day at the races when commiserating over the best vintage. 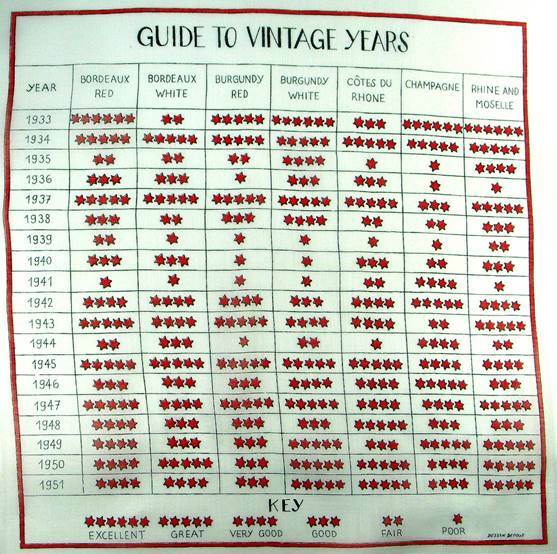 The years depicted give you some idea of when this hankie was in use. 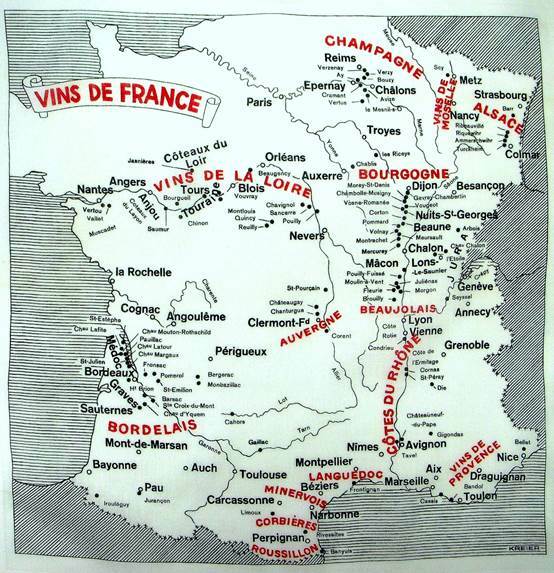 A second men’s handkerchief depicts growing regions, wines and wineries for those motoring through the countryside. 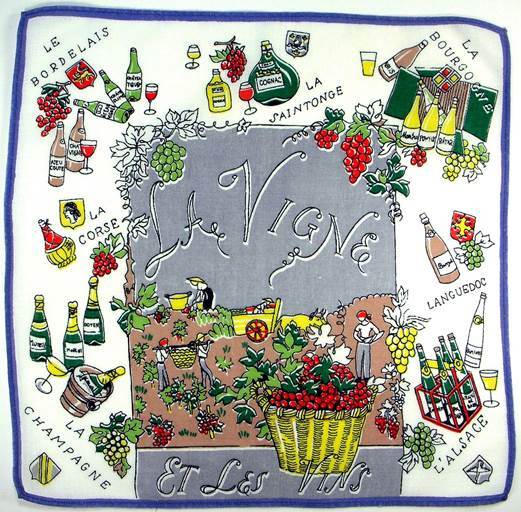 Souvenir from a 1955 Fete des Vignerons or Wine Feast in Vevey, Switzerland. 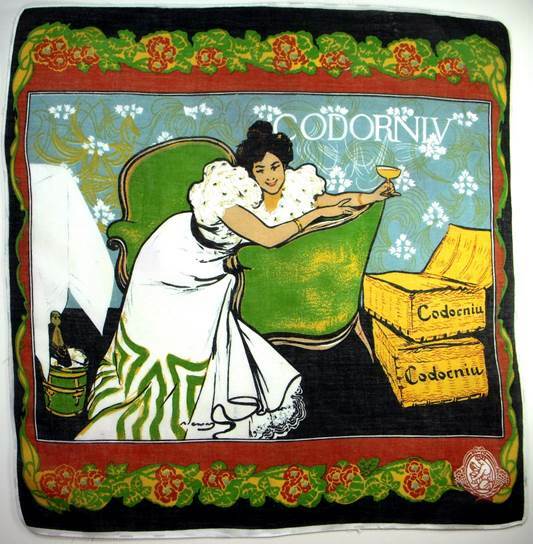 Reminiscent of an Aubrey Beardsley print, this handkerchief hails from Cordorniu, the world’s oldest producer of bottle-fermented sparkling wine, known as cava. Made by the traditional champagne method, it was founded in Catalonia, Spain in 1551! In 1976, the Codorníu cellars were declared “a National Monument of Historical and Artistic Interest” by King Juan Carlos I. 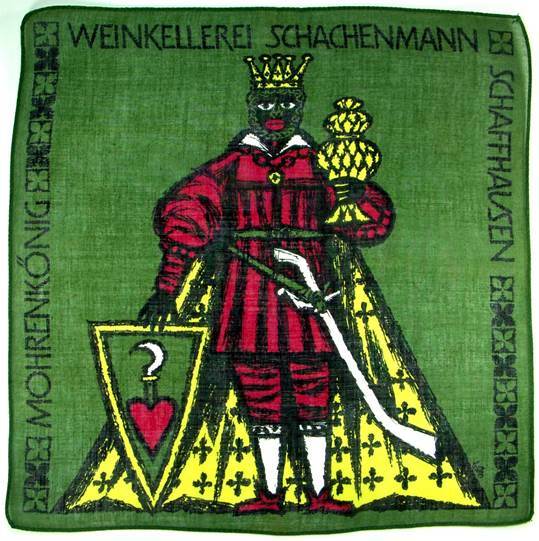 This princely attired gent complete with shield and sword at first seems to belong in our heraldry blog, and in fact, the border features “Schaffhausen” a medieval town which still boasts many renaissance buildings. But look more closely “Weinkellerei” is German for winery, and “Schachenmann” is a winery which produces a variety of wines. We’ve all heard some version of the famous Rubaiyat of Omar Khayyam (1048-1131), illustrated in simplified graphics on the left. 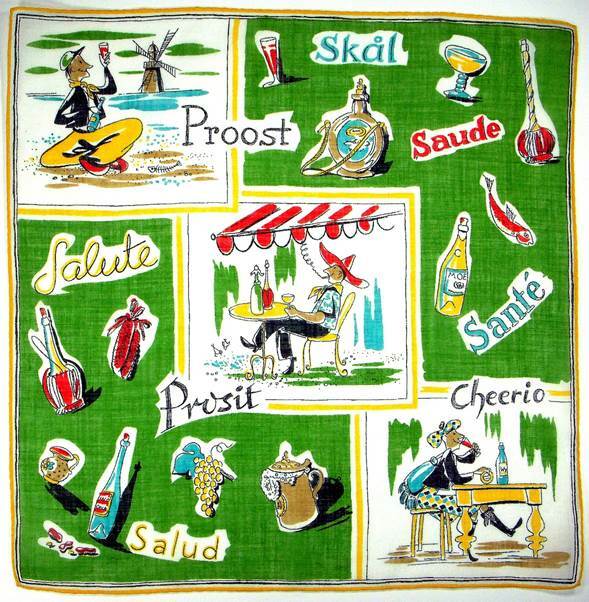 In contrast, the handkerchief on the right reads like a still life in oils. The succulent peaches draped in a blanket of cream, nestled alongside chilled champagne practically sigh with romance. 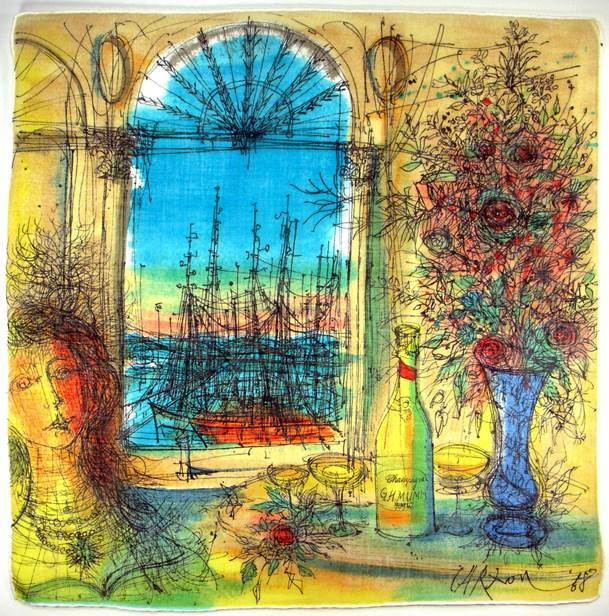 This image immediately brings to mind the blissful Bellini, signature cocktail of Harry’s Bar in Venice, Italy. Named after 15th century Venetian artist Giovanni Bellini, the light, sparking libation was invented in 1931 by Giuseppe Cipriani, the owner of Harry’s Bar (a favorite haunt of Ernest Hemingway, Sinclair Lewis, Orson Welles, and others). 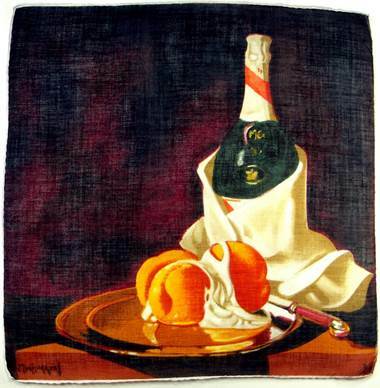 Although served in a champagne flute, the base is not champagne, but Prosecco, an Italian sparkling wine. Add to that some white peach purée, and you have the famous cocktail. According to their history “The secret of Cipriani isn’t about what can be seen or touched, but what can be felt and sensed. It is intangible but palpable. It can’t be patented, but even after eighty-two years it hasn’t been duplicated by others.” You can now find Ciprianis in New York, London, Hong Kong, Monte Carlo, Istanbul, Abu Dhabi, and Ibiza. 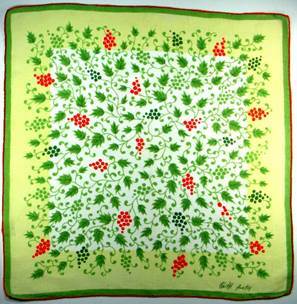 The lovely handkerchief evokes, for me, the work of Marc Chagal. There is a story here, but we’re left to guess the dénouement. The champagne has yet to be savored. Did it arrive with the flowers? Is she waiting for the sun to set so she can rendezvous on her lover’s ship by moonlight? Or is she greeting the sunrise, having waited all night for a beloved who never arrived? So many possibilities to ponder. 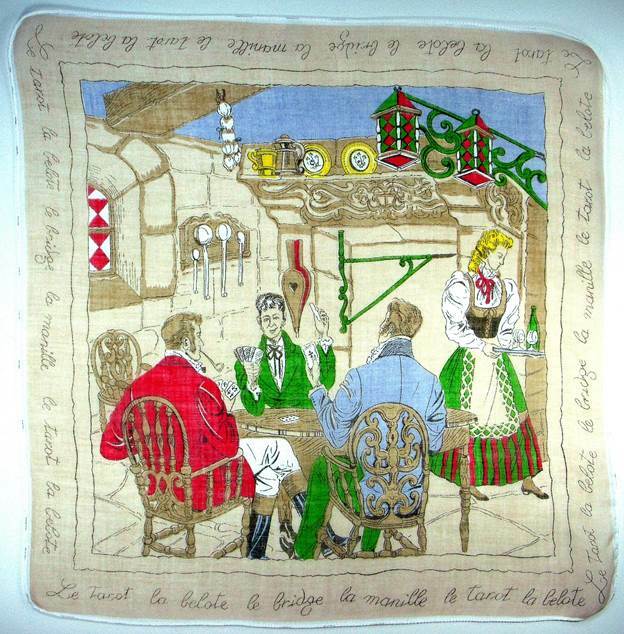 I love handkerchiefs with stories, and I’m sure whoever saved this one for nearly half a century has their own tale of romance to relate. From the snifters on the tray, it appears mademoiselle is serving brandy to our card playing trio. The border lists numerous card games to underscore and “frame” the theme. 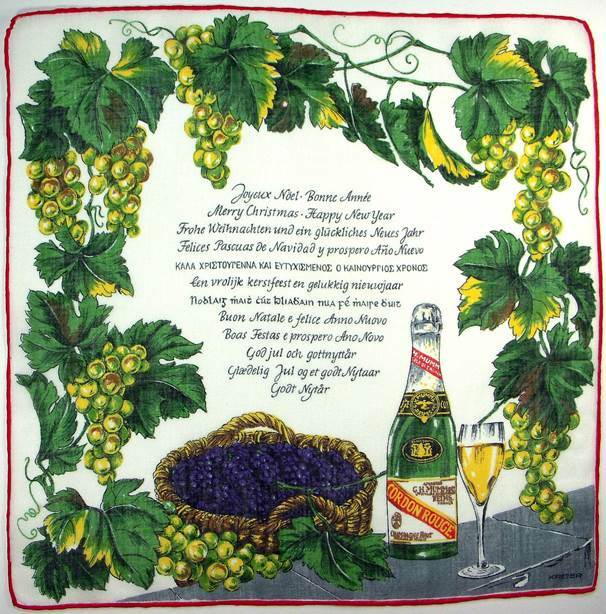 Although not strictly a wine/champagne handkerchief, because it’s in the “spirit” (sorry, couldn’t help myself) of our blog, it’s included here. 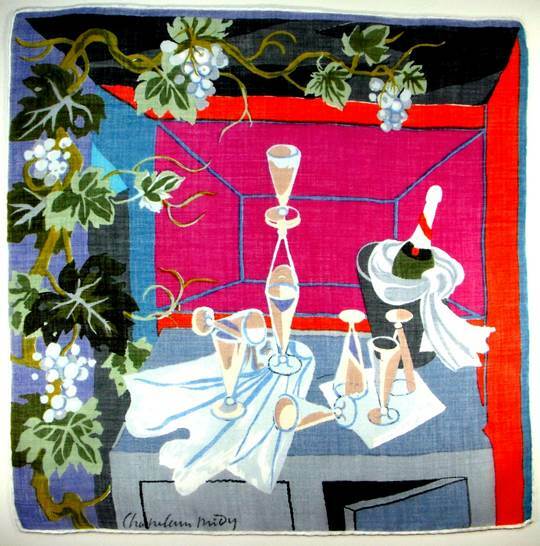 It’s time to raise a glass and offer a toast to good health and much happiness in the New Year. Ann, I so want all of this in a book I can read! I am so astounded in the wealth of your hankies and your so very eloquent words! Takes my breath away! Your book of your thoughts, prose, hankies, etc,,, would be incredible Ann! We need to get you ON girl!!! Just reviewing some work and realize that I never responded to your always supportive and positive feedback for which I am truly grateful. I too, would love to see these in a book, but sadly have zero time for social media once I’m through w/my day job and with researching/writing my blogs. I run out of daylight before I run out of tasks to complete. Perhaps someday…..